Ken Bonfield: Calling bonfield a guitarist is like calling michelangelo a painter. Fingerstyle Guitarist Ken Bonfield has performed throughout the United States for more than 20 years. Based in Gloucester, Massachusetts, Bonfield is a regular at guitar festivals, concert series, and acoustic venues across North America, and has released seven albums. His latest, Legacy, is a solo effort that focuses on harp and baritone guitars, with several new arrangements of original tunes Bonfield recorded on earlier albums. 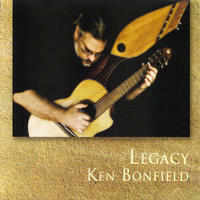 Although he came out of the 1960's folk tradition, Bonfield was closely associated with new-age music in the mid 90's. Today his sophisticated Americana compositions feature a solid dose of Celtic, jazz, and traditional folk influences that might best be described as American Baroque. In his open-hearted, welcoming concerts, workshops and master classes, he shares new guitar dimensions and sonic explorations with his listeners. 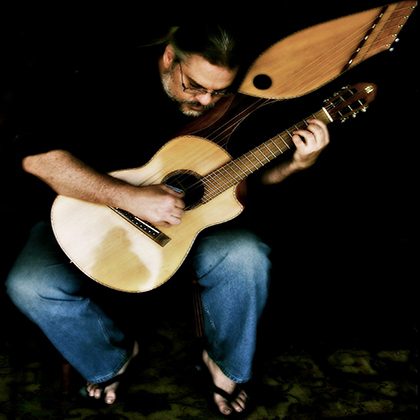 His compositions are performed with his unique "chamber ensemble " of handcrafted instruments ranging from baritone guitar to an 11-string harp guitar to a high-string guitar which Bonfield likens to a 6-string, Steel-String ukulele. Bonfield has been a featured performer at some of the finest acoustic venues, coffee houses, music festivals, and guitar festivals in North America such as Club Passim, Eddie's Attic, Uncle Calvin's, Be Here Now, Acoustic Sounds Cafe, Kent State Folk Festival, Falcon Ridge Folk Festival, Montreal Guitar Festival, Newport Guitar Festival, Healdsburg Guitar Festival, Memphis Guitar Festival and Santa Barbara Acoustic Instrument Celebration, appearing with a wide range of icons and contemporary artists ranging from Arlo Guthrie to John Mayer, including Canadian folk hero Garnet Rogers, and Pierce Pettis, Dee Carstensen, Cosy Sheridan. Bonfield has also shared the stage with guitar legends Larry Corryell, Adrian Legg, Ed Gerhard, Muriel Anderson, Stephen Bennett, Tim Sparks, Dakota Dave Hull, and countless others. Bonfield's work is inspired by a deep love for the beauty, the sounds, and the craft of the acoustic guitar. Most of his compositions and arrangements utilize alternate tunings that extend the lower register of a standard guitar, and feature memorable melodies. Bonfield has the rare ability to compose new music that sounds like music we've heard many times before. "Everyone that attended last night's concert left with the sense they were receiving a perfect gem. It was intimate, remarkable musicianship. Ken's music is heart music, and our hearts all got bigger last night." Laurie Low, Rising Star Mill. "Ken Bonfield is a child of Leo Kottke.ÃŠHe shares Kottke's intricate finger picking techniques and casts them in an intimate setting that he calls, American Baroque." John Diliberto, Host of PRI's Nationally Syndicated show Echoes. "Ken Bonfield's instrumental guitar work patently avoids the incessant noodling...instead melody is king and Bonfield's gifted fingers flesh out a beautiful cavalcade of notes that are at times reminiscent of a human voice singing and often soaring." "Ken Bonfield knocks me out. He plays with the two main ingredients I look for in a player; heart and passion. He's a player's player, and I'm a die hard fan." John Beland, Flying Burrito Bros.
"Eddie's Attic is singer/songwriter heaven in the South East, but Ken Bonfield is so good he doesn't need to sing to be a hit here.ÃŠHe's the real deal!" Ken Bonfield lives in Massachusetts, USA. Tagged as: World, Folk, Instrumental, Acoustic Guitar.